Where murderers can’t be executed but new born babies can …. In New York, capital punishment is not allowed and murderers cannot be executed. 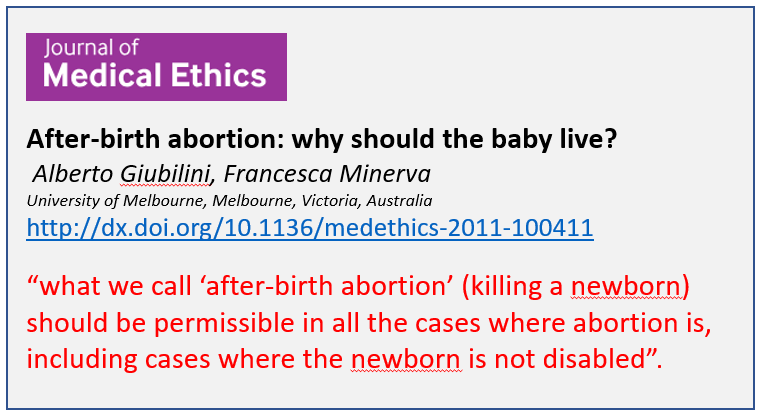 But new born babies can be killed after-birth whenever an abortion could have been justified. And to have an abortion is apparently always justified. It would seem that the moral justification of abortion on demand and for convenience, is now being extended to include infanticide by rebranding it as “after-birth abortions”. In New York hospitals, you can find premature newborn babies surrounded by dedicated doctors and nurses fighting to save their lives. Next door, you now might find physicians and non-physicians alike giving lethal injections to babies the same age, thanks to the state’s new so-called Reproductive Health Act. Over a decade ago, New York abolished the death penalty for convicted criminals, but as of last week, babies in the seventh, eighth and ninth month of their mother’s pregnancy — old enough to live outside their mother’s wombs — can now be given lethal injections. Abortions at that stage are committed by piercing the baby’s brain or heart with a large needle and injecting her with enough digoxin to cause cardiac arrest. Labor is then induced, and the mother delivers her dead child into the hands of an abortionist. Abortion-rights advocates say that late-term abortions are only performed in cases where a mother’s life or health is at risk or the child suffers from a life-threatening condition. But this is false. According to research published by the Guttmacher Institute, which supports abortion rights, abortions for fetal abnormalities “make up a small minority” of late-term abortions; those for saving the mother’s life are an even smaller number. The majority of late-term abortions aren’t done for so-called “medical reasons” at all. This entry was posted on February 1, 2019 at 8:54 am and is filed under Behaviour, Ethics. You can follow any responses to this entry through the RSS 2.0 feed. Both comments and pings are currently closed.